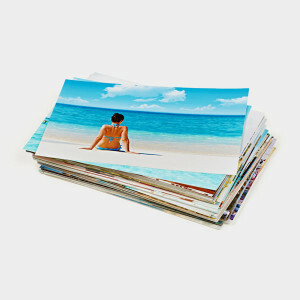 Prints from in-store photo centers cannot be recycled because they were processed with chemicals or chlorine. These chemicals, in general, will weaken the integrity of the newly recycled paper. Photographs that have a resin-coated finish appear glossy. Glossy photographs are often made with a plastic, so cannot be recycled because the plastic would contaminate paper recycling. You can donate old photographs with historical value to organizations like the Society of American Archivists. These organizations want to preserve family histories and share them with others. You can make at-home printing more eco-friendly by using cotton rag paper. Photo Rag® Baryta by Hahnemuhle is a recyclable paper that uses a natural gloss. Cotton-rag paper is considered one of the more eco-friendly options because it’s sourced from the textile making process. HP’s Everyday Glossy Photo Paper is an affordable and eco-friendly alternative to plastic for at-home printing. It is a mixed paper that can be recycled. Consider turning unwanted photos into postcards by writing a fun message on the back and sending them to family and friends. Photographs are great tools used to study the environment and to create awareness. Whether we are talking about photos taken from a satellite or of a community, all different kinds of photos can document the beauty and destruction. In the video shown above, satellite images of the Amazon reveal the extent of deforestation in the last decade.